The District V Thespian Festival (a.k.a. "Districts") is a three day event at which you will have the time of your life. It is made up of two days of One Act Competition and one day of Individual Event Competition. The dates for the 2017 District Festival are November 16-18. Where is District this year? Ocoee High School. Thanks for hosting, 6893!!! How much does it cost to attend District? Registration is $30 per person plus a $50 troupe registration fee, but you should check with your sponsor. The total cost varies from school to school based on transportation, chaperone fees, and other variables. With more than 1200 teenagers who love theatre, love performing, and love each other all in one place for 3 days, how could it not be? Is it District or Districts? Yes. Sure. Both. Who cares? What should I expect when I get to District? On one act days, you can expect that there will be a load in time before your performance block. Once you're about to perform, there will be 30 minutes of makeup time, then your performance. You will load out your set at the end of the block. If you aren't performing in a one act, you will spend most of the day watching one acts from other schools. On IE day, events start at 9 AM. Most students like to go support their friends and watch IEs. You are welcome to watch any event in any room at any time. If you are performing, you should arrive to your room at the call time posted on the schedule. What happens if I miss my IE performance time? First, BREATHE! Everything will be fine! Then, have your sponsor come to registration. We will find a new slot for you later in the day and fit you in. A person involved in the theatre. According to legend, Thespis was the first actor in ancient Greece, so we call ourselves Thespians after him. Who can come? Do I have to be an inducted Thespian to go to District? Any student who attends a school where there is an active Thespian troupe may be registered. Home schooled students may participate with the school to which they are zoned. Ultimately, the troupe sponsor decides who may attend with your troupe. The host school provides delicious concessions for you to purchase. You may also bring a sack lunch. Sponsors, troupe tailgates are not permitted. It depends on how much you eat. Figure $5-8 per meal if you're rocking the concession stand. What is a One Act? A short play that has only one act. At District, a one act can be no longer than 40 minutes. You can find the rules here. IE stands for Individual Event. There are many categories of IEs. You can find all the rules regarding IEs here. Can I do scenes from movies/TV/original works for my individual event? NO! All pieces for IEs must come from a PUBLISHED work written for the stage. If there is a stage version of a film, you must use the stage version (for example, Steel Magnolias is both a film and play. You have to use the play version). The only exception is playwriting, which is by definition an original piece. One Acts, on the other hand, can be original works. Can I wear a costume during an IE? From the State website: "Students are encouraged to wear appropriate audition/rehearsal attire in all Individual Events." YES! District is a school function, therefore your school dress code applies while you are at District. Is it happy hands? Or clappy hands? District V deviates from the State rule and allows "polite applause" at the conclusion of performances, so yes, you can clap. But don't go crazy. How does one get disqualified (DQ'ed)? By failing to comply with the rules of the competition. 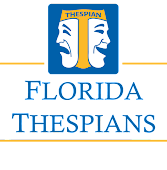 District 5 complies with ALL State Thespian rules. IE rules can be found here. One act rules can be found here. The most common reason for a DQ in IEs is going over the allotted time. DQs in One Acts most frequently are to do with the load out of the show. They are our way of letting audience members know that there is content in a piece that might make them uncomfortable. For example, if a piece contains any reference to death, we alert our audience of this before the performance. You wouldn't want to make someone sit through a monologue about a kid that has lost their parent if that audience member just lost a parent, right? So we warn each other, because it's only polite. You can find more information about it here. Do I have to have accompaniment for a musical event? From the State website: "The performer MUST use non-vocal musical accompaniment which can be live or taped unless expressly written to be performed without musical accompaniment. If we hear ANY voice on the accompaniment tape, you will be disqualified." A piano and CD player will be provided for every music event room. iPod/mp3 player docks may not be available. The slate is your introduction to the performance. It should include the performers name(s), the title of the selection, notice of asterisked material, and troupe number. The time for the event begins when the last digit of the troupe number is said. Can I leave during a performance? NO. Once the slate (introduction) is complete and the performance begins you may NOT exit. How are Best in Show's selected? The judges in each individual events room will select a Best in Show from their superior rated performances, that they feel best represent the technical and artistic merits of the room. This may not be the highest scoring event in the room. The only qualification is each judge must have given a superior and all three judges must concur on the choice. How are Critic's Choice's selected? One performance and technical individual event are selected from the Best in Shows. Each troupe director gets one vote. The purpose of the Critic's Choice is to represent District 5 at the opening ceremonies at the State Thespian Festival. How are Best in Show's one acts selected? The one act judges select the Best in Show from the Superior rated one acts in both performance and technical scores. This may not be the highest scoring one act. The only qualification is each judge must have given a superior and all five judges must concur on the choice. The number of One Acts selected as Best in Show is based on the state approved matrixes.